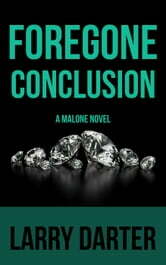 Foregone Conclusion is the fourth novel in the thrilling Malone Private Investigator Series of Crime and Suspense Thrillers. If you like breathtaking action, laugh-out-loud humor, and a hint of romance, then you'll love this edge-of-your-seat detective story. Over 15 years after the biggest diamond heist in U.S. history, the whereabouts of $68 million worth of the stolen gemstones remains a mystery. Are they hidden beneath the floorboards of an abandoned building somewhere? Were they sold to Arab princes on the down low? Or are the diamonds in some jewelry store's window the same ones stolen in 2003, laundered through middlemen until they were clean enough for a legitimate dealer to buy them? Los Angeles PI Ben Malone is good at finding things. Whether it be a missing person, a runaway child, a deadbeat ex-spouse, or hidden assets. When one of the stolen diamonds surfaces, the insurance company that swallowed the loss wants to hire Malone to answer those questions. Along with the case, they offer him the promise of a $500,000 bonus if he recovers the diamonds. But, even for Malone, recovering the loot from a 15-year-old diamond heist is no foregone conclusion. Kyle Murray, one of three men responsible for the heist, and the only suspect arrested for the crime did his time telling no one what happened to the missing diamonds. Fifteen years later, Murray has been paroled and promptly disappears, his whereabouts unknown. Malone, lured by the chance at a half-million dollar payday, takes the job. But once Malone and his Kiwi sidekick T. J. O'Sullivan get to work, it becomes clear that the case is far more challenging, not to mention treacherous than they'd assumed. Not only do they find themselves following a convoluted trail of clues halfway across the globe, but they also discover they aren't the only ones on the trail of Murray and the stolen gems. Along the way, they encounter an evil shyster ex-lawyer, and his cold-blooded female partner, who quickly reveal they will stop at nothing, including murder, to eliminate any competition in the search for the fortune in diamonds.